Anyone else heat with wood? pa2a.org » The War Room » Prepping and Survival » Fuel & Energy » Anyone else heat with wood? I installed an outside wood boiler 3 years ago, and I will never look back!!!!! It keeps our 100 year old 2200 sq foot house at 74 degrees ( thats right barrak i said 74) all winter long! I put radiant pipes in the downstairs and hot water baseboard heaters upstairs. it is tied into a propane fired boiler as a back up, but I never even lit the pilot light last winter:-) Don't get me wrong, I work my tail off cutting wood, but in out of pocket expense, my heating costs last year were the gas in my saws, and truck, bar oil. Rugerfan, proud to be a member of pa2a.org since Oct 2012. 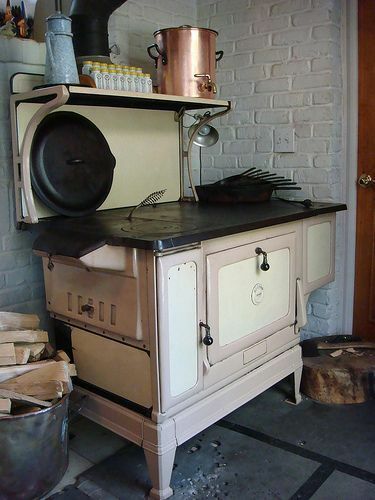 My grandfather had a cast iron wood-fired cook stove in his kitchen that he almost always had burning for the heat it threw. He used to let me light the fire when it needed "re-lit". This is pretty close to the one he had. I believe it had storage on top with doors, as opposed to just a shelf. Otherwise, this example is nearly identical - right down to the tools used to lift the plates off the top of the cook surface. I have a very small woodstove in the main room of the first floor of the ranch house. It's only about 24" across, and takes 18" logs. I've been tracking my oil consumption for three years, and was using about 75 gallons each month during the heating season, and about 20 during the summer - hot water setup. I installed an electric hot water heater, and moved to wood as primary for the ranch house...I use an average of 100 gallons a YEAR now, and it heats the entire first floor. A small electric blower helps spread the heat around... Sure, I keep the furnace breaker off when the Princess isn't here, and sleep downstairs, but wood is sooo much cheaper, there's no way I'm going back to oil as primary. Oh...during cold times, the ranch house stays around 75-80 during the day, and about 65 at night. Wood is good! Has anyone here swept their chimney themselves? I'm feeling I should probably do mine this spring since I have no way of knowing when it was done last. I have all the tools to do it, just never did. The problem I have with the woodstove chimney is the type of woodstove I have. It's kind of set back into a brick fireplace opening with a metal shield around it and the brick. The smoke exits the stove in what appears to be a 2" high chamber at the top of the stove. So if I run a brush down the chimney I'm not sure how to get the yucky stuff back out. streaker69;133296 Wrote: Has anyone here swept their chimney themselves? I'm feeling I should probably do mine this spring since I have no way of knowing when it was done last. I have all the tools to do it, just never did. The problem I have with the woodstove chimney is the type of woodstove I have. It's kind of set back into a brick fireplace opening with a metal shield around it and the brick. The smoke exits the stove in what appears to be a 2" high chamber at the top of the stove. So if I run a brush down the chimney I'm not sure how to get the yucky stuff back out. Im assuming it's not piped into the flue then? Is there a way to rig up something attached to a shop vac to collect the creosote as it falls down through. Or, pull the stove out? That's what I don't know how it's configured in the back. It was definitely a fireplace and the woodstove was put in, because there's a handle/rod for the old flue connection through the brick. The woodstove has it's own flue handle built into it. Pulling it out might be the only option, but the one I dread. Mr_Gixxer;133297 Wrote: Im assuming it's not piped into the flue then? Is there a way to rig up something attached to a shop vac to collect the creosote as it falls down through. Or, pull the stove out? Can you remove the baffle in the top of the stove? I always sweep my chimney, but I have a clay connection to the stove pipe. Your situation is way different. Good luck with that. streaker69;133298 Wrote: That's what I don't know how it's configured in the back. It was definitely a fireplace and the woodstove was put in, because there's a handle/rod for the old flue connection through the brick. The woodstove has it's own flue handle built into it. Pulling it out might be the only option, but the one I dread. I don't think so. I just took a closer look at it, and I think the entire thing would need to be pulled out. It's Liberty Bell brand, manufactured in 1979 apparently. If I have to pull it out, I'll probably throw together a wheeled cart that's just the right height of the bottom brick layer of the fireplace so that we can slide it right onto a cart and the wheel it out of the way until the work is done. Try to gain access to the inside of the brick fireplace to see if it's got a liner run up through from the top of the stove. If you can't look up from the inside at all you could probably remove the flashing or at least pull it back. Either way if you don't know if it's lined it needs pulled. Period. Don't risk your house to fire because creosote may be falling behind your insert and piling up. Better to know and do it right if it isn't already. Seen my fare share of flue fires working for the VFD. All of them are caused by negligence. Don't be THAT guy. And think about this, if you've got a flue fire guess what. No more warm house because you probably cracked the terracotta liner. It'll need fixed before you can burn again and it won't be cheap. Don't want THAT especially considering the weather we've been having.